A smidgeon of light, a tentative mildness, the promise of some sun this morning has put me in the mood for France. Forget about the oppressive heat of Dubai, where Karl has been showing his Cruise Collection; a pleasant sojourn to the movie capital of the Med would be just the ticket. L-R Willem Dafoe, Leila Hatami, Nicolas Winding Refn, Carole Bouquet, Jane Campion (President), Jeon Do-yeon, Sofia Coppola, Zia Zhangke and Gael Garcia Bernal. Director Jane Campion is in good stead amongst her panel this year, presiding over such luminaries as dashing actor and director Gael Garcia Bernal and French former Bond Girl Carole Bouqet, but it’s birthday girl Sofia Coppola who, looking chic as ever, deserves a turn in the spotlight, having turned 43 yesterday. When I’m devising my list of style icons (Solange (tantrums aside), Diane, Olivia, Laura Bailey) I often forget about Sofia thanks to her nonchalant, un-starry, totally, totally cool attitude, but she always looks great in her simple uniform which is more often than not black and Marc Jacobs. Starting her career as an actress, playing the baby boy being baptised in daddy Francis’s seminal flick, The Godfather, she has since proven, after claims of nepotism and some critical panning, that her talents lie in direction. All her films have a distinctly stylish quality, from Scarlet Johannson’s fish out of water in Japan in Lost in Translation, Kirsten Dunst gadding about the place to rock music in sky high wigs in Marie Antoinette, and nice little Hermione robbing celeb houses in Juicy Couture in The Bling Ring. Her own personal style errs on the side of demure, however, and it’s a look she’s got down to a tee. She has mastered monochrome and simple pallets, and is never too fussy. She knows that a slick of statement lipstick can pull the whole outfit together. 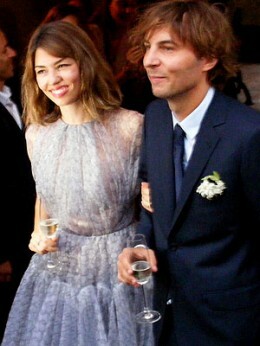 … and her dress on the occasion of her marriage to French musician Thomas Mars was typically un-traditional, utterly gorgeous and absolutely her. So back to Cannes, and her first trip down the red carpet fantastic. A slightly conservative long-sleeved smock like this Valentino dress is given edge by the lovely slim wedges. Her hair is styled a tad neater than her usual casual messy bob, but if works. Joining her at the screening of Grace of Monaco, which has already reviewed horribly, not altogether unsurprisingly given the recent Diana disaster, were a host of starry stars. There are a few ways to ‘do’ Cannes – serene sophistication, look-at-me glamour for those eager to get noticed by the international press and Gallic glamour being the main three. Where do you think Sofia falls?! This is just the beginning – the film festival goes on until May 25th and there are sure to be many more gorgeous gowns to look out for, not to mention the daytime looks that are perfect for planning your summer holiday wardrobe around. The sun is doing it’s very best right this moment to peek behind the clowns, so it may be sooner than you think! Just remember, if in doubt: Breton top.